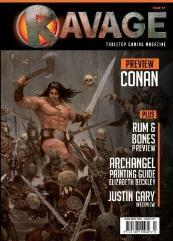 #17 "Conan, Rum & Bones, Archangel Painting Guide"
Ahoy, Ravage readers! Welcome to Issue 17, and what an action packed issue it is. Beyond the striking cover, you’ll find so many exciting previews, reviews, and guides, you might have to read it twice to take it all in. Readers get an amazing preview of Monolith’s new Conan board game, bound to excite casual and diehard fans of the iconic barbarian. You’ll also get an early look at CMON’s newest game, Rum & Bones, that brings the MOBA video game genre to the table. Also features an article with Justin Gary, the man behind the popular Ascension deck building game. As always, the wonderful General Consensus feature is here, along with game reviews, a BGGCon report, painting guides, and so much more. So hoist the sails, sit back, and sail off into this issue of Ravage.